SIOUX FALLS, S.D. 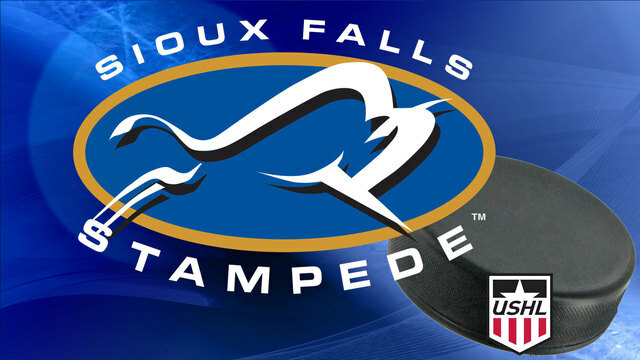 - Sioux Falls, SD—Andre Lee and Ethan Phillips tallied the only goals the Stampede would need in a 2-1 victory over the Madison Capitols before 5,009 fans at the PREMIER Center Saturday night. The win was the Herd’s fourth straight victory and third straight on home ice. At 5-1-1, the Stampede are off to their best start since 2004-05 in which they started 6-1-0. Chad Veltri stopped 24 of 25 shots to improve to 3-1-1 on the season. Sioux Falls currently sits just one point back of first place Tri-City and Waterloo. For the third straight game the Stampede were able to grab the first goal of the game. The Herd were able to get on the board at 11:24 when Andre Lee tallied his third goal of the season. Lee brought the puck over the Madison line before dropping it to Anthony Romano who quickly sent a pass back to him at the top of the left circle and Lee wristed a shot past the glove side of Madison goaltender Joey Lamoureaux. The Stampede outshot the Capitols 15-9 in the period. Things slowed down a little in the second period between the two teams, but the Capitols found the back of the net at 10:57. Luverne native Chaz Smedsrud found Noah Weber open in front of the goal and Weber tapped the puck past Stauber to make it a 1-1. The celebration wouldn’t last long however, Sioux Falls regained the lead 19 seconds later when Andre Lee sent a pass from behind the net to Ethan Phillips who lifted it into the back of the net for a 2-1 Stampede game. It was Phillips first career USHL goal and Lee’s second point of the night. Sioux Falls outshot Madison 17-10 in the period. Both teams battled in the third back-and-forth in the third, but both teams played well defensively. The Herd went on a 5-on-3 midway through the period, but couldn’t convert. The Capitols were awarded a power play with 2:15 remaining in regulation and pulled their goaltender for a 6-on-4 advantage, but could not convert either and the Stampede held on for the 2-1 victory. Sioux Falls outshot Madison 8-6 in the period and 40-25 in the game. Both teams finished the night 0-for-5 on the power play. The Herd return home on Friday to host the Sioux City Musketeers at 7:05 PM. It is also Trick-or-Treat night, presented by Marmen Energy. Kids are encouraged to wear their costumes to the game and trick-or-treat in the main concourse from 6 PM to 7:05 PM. Kids can get face painting at Marmen Energy’s table and also take part in a costume parade in between periods.